Naoko Tanaka was born in Kurume city, Fukuoa Prefecture, Japan in 1985. She began her classical training on the piano at the age of three. She graduated from Toho Gakuen University in 2006. During the University, she won the first prize at the Bulgarian International Music Competition. 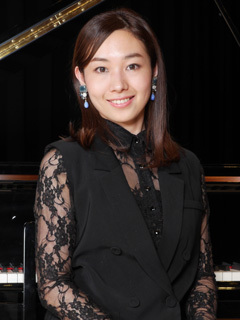 She performed the piano at the Toho Gakuen graduation concert as a representative of Kyushu and Yamaguchi area. After graduating in 2006, she began playing Jazz piano and soon started to play with various Jazz musicians. Also, she has joined and hosted many Jazz sessions. In 2009, she produced and recorded her first piano trio “Protean” album with bassist Naoyuki Seto and drummer Dan Yoshikawa. In 2012，she started to play with bassist Koji Yasuda and drummer Yasunori Ando as her own trio “Tanaka naoko Trio”. In 2013, she made her debut in Shanghai. She has played the piano at JZclub in Shanghai on a regular basis. In 2014, She was appointed a Kurume oldness and special ambassador. She wears stage clothes made of Kurume Kasuri textile which is special product in Kurume City in order to introduce people to Kurume City as the ambassador. In 2015, she released her debut album “Memories” as Tanaka Naoko Trio and guests who are bassist Daiki Yasukagawa and trumpeter Yoshiro Okazaki. Her new album “Memories” includes seven her original songs.